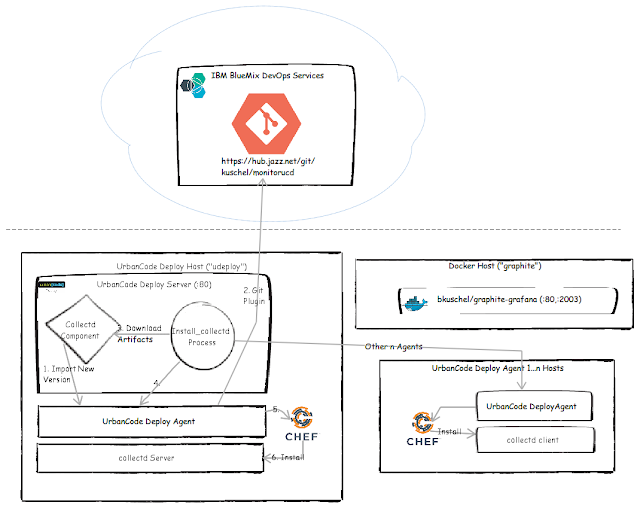 Monitoring an UrbanCode Deploy server (sometimes more in HA setups) and it's agents requires keeping track of resource utilization multiple environments, the UrbanCode deployment server(s) itself and the linkages between (ie. the network). In addition to resource utilization, log files should also be monitored for abnormal activity and traffic. There are commercial offerings which do these types of things but since UrbanCode Deploy itself is a deployment solution, it can be used to deliver monitoring to nodes. All that's is needed is monitoring agents and a collector and a means to configure and connect it all together. For the time being this solution is solely for a Linux environments (RHEL, Ubuntu and variants) but this solution can be adapted to other OS's as many of the components have counterparts for Windows, AIX and other OS's. So how do we get there? Well, one approach is to set it up manually, quite an operation if you have 1000s of agents, so we'll need to do better. First, the assets need to be installed. An UrbanCode server with a few agents. 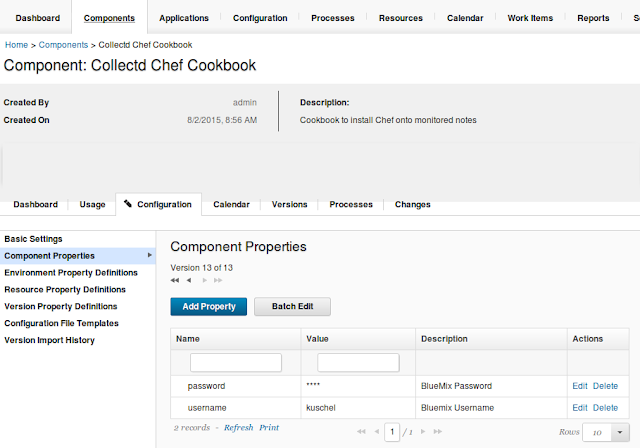 You'll also need to install the chef plugin from here: https://developer.ibm.com/urbancode/plugin/chef. 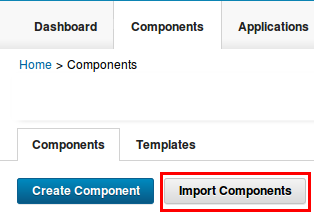 I also created a plugin with groovy that adds 2 additional steps for components. One step gets the latest version for a component, and the other step gets an ID for a version in the component. You can see the source code here, it's a good example of how to create a custom plugin. It's quite simple. The component is preconfigured to connect to IBM BlueMix DevOps Service Git and pull the recipe periodically and create a new version, you may change this behaviour in Basic Settings by unchecking the Import Versions Automatically setting. 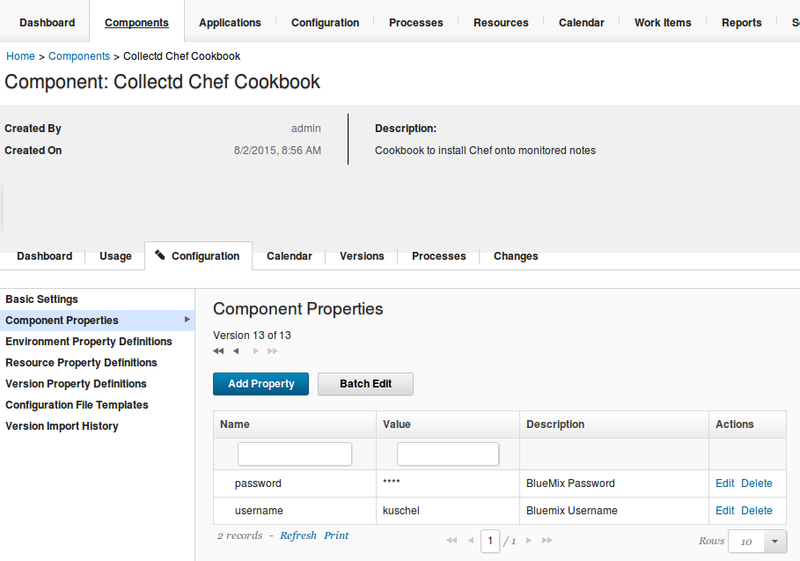 All you need to do now is supply a BlueMix username and password in the component properties page. You may need to enter a jazz.net username, if applicable (without a domain). NOTE: I noticed that after importing the generic template the versionName step in the Generic Import_collectd process design (design tab) had three bullets "•••", this needs to be updated to ensure that the Secure Property Value field is blank. If it's not, the fetching of the latest version will fail when version is not specified. Now run the image and bind the ports 80 and 2003 from the docker container to the hosts ports. You can also mount file volumes to the container that contains the collector's database, if you wish that to be persisted. Each time you restart the container, it contains a fresh database. This has its advantages for testing. You can also specify other configurations beyond what are provided as defaults. Look at the Dockerfile for the volumes. Once the solution is installed all that needs to be done is to execute the process on UrbanCode. Yes, it's that easy. Go to the Process Tab in UrbanCode Deploy Server, Click on Run Next to the "Install_collectd" process. Is this a collectd Server? : If you look at Fig. 1, you'll see that many collectd clients connect to a central collectd server. If this node is the central collectd, this should be checked. Generally, this should be the main agent in the UrbanCode Server, usually co-located with the server. 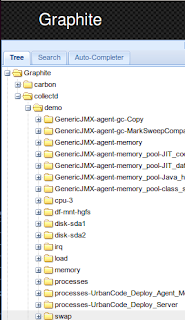 Collectd Server (client)/Graphite host (server): if "Is this a collectd Server?" 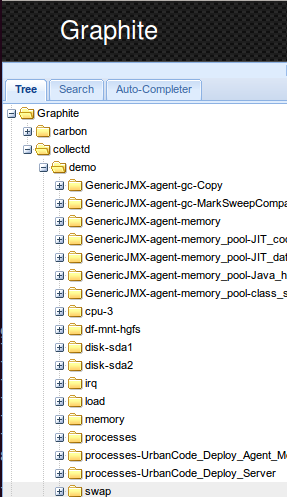 is checked then this is the graphite server host, the host that is running the docker container. Otherwise this the collectd server host. UCD Server: The installation directory of the UrbanCode server (ex. 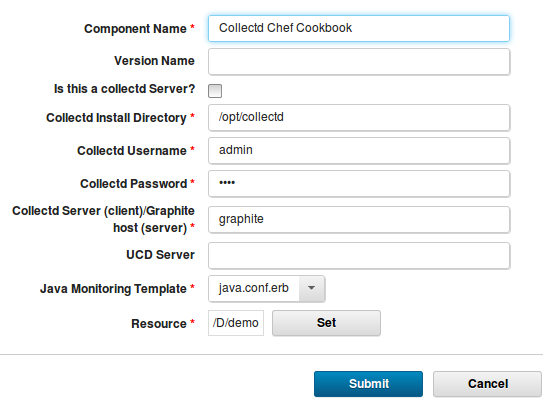 /opt/ibm_ucd/server) if this collectd is to be installed on a node with a server. Java Monitoring Template: If UCD Server is set and is installed on tomcat, select tomcat.conf.erb, otherwise select java.conf.erb. Resource: Select the agent that this process should be executed on. (the host. 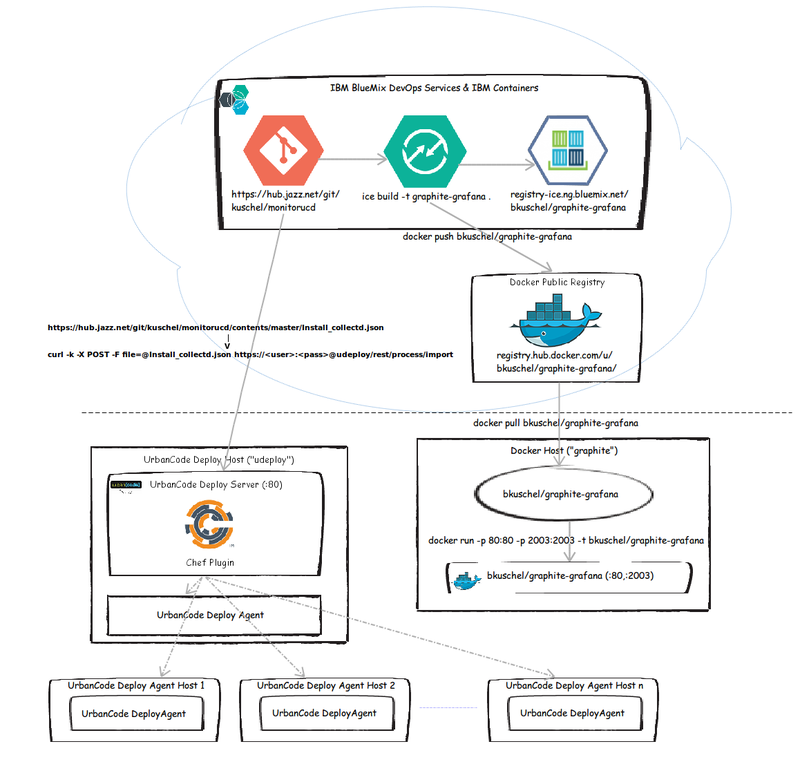 You can also navigate to Grafana at http://<Docker Host>/grafana. Note that the username and password for both Graphite and Grafana are admin/admin. 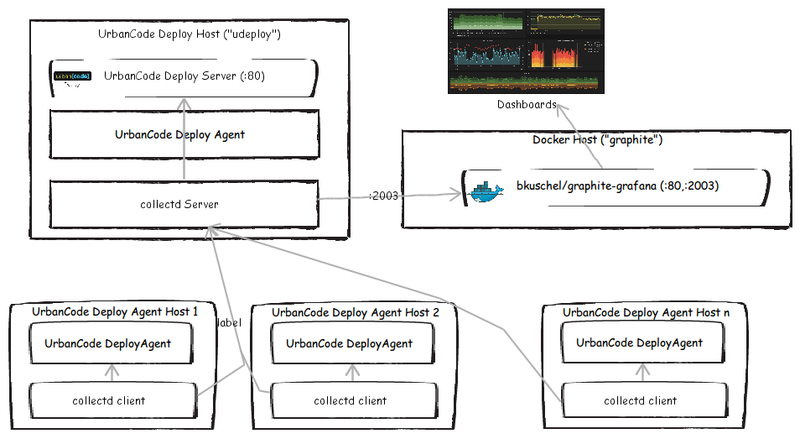 The UrbanCode Deploy Process, how does it work? Collectd Collection Options (and the nmon option!). How to create useful graphs in Graphite and dashboards in Grafana. I will cover these in subsequent postings. In the meantime, try to set it up and see how it goes. If you're lucky, you end up playing with some cool metrics and graphs in Graphite/Grafana. I have never seen a article like this before, definitely your blog will reach higher in blogger world.